LOCALS AGREE there are problems with Alta Plaza Park, situated atop a former rock quarry and bounded by Scott, Clay, Steiner and Jackson Streets. Among them: decayed columns, stairs, walls and pathways; haphazard and incongruous plantings; outdated and ineffective lighting; and drainage and irrigation issues. So far, the fixes have been piecemeal — and ineffective, particularly the new no-mow grass and attempts to stop leakage onto surrounding sidewalks. In February, the community group Friends of Alta Plaza Park enlisted landscape architect Jeffrey Miller — whose firm designed the new playground that was part of the recent renovation of the neighborhood’s Lafayette Park — to help formulate a master plan for an integrated overhaul of Alta Plaza’s infrastructure and aesthetics. Miller solicited community feedback as he developed his plans, and at a final public meeting in November he unveiled the latest iteration of his proposals. 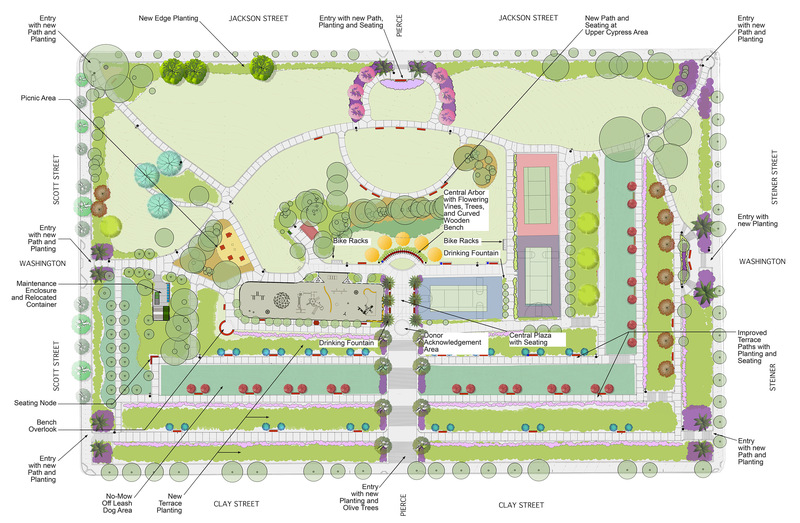 Among other things, the master plan, published above, features reworked entryways and plantings along the park’s perimeter. It adds a picnic area and creates a central plaza with a seating area overlooking the view of the city to the south. It also adds a new pathway and additional seating at the top of the park. The plans, which will be presented to the city’s Parks and Recreation Commission for approval in February, were considerably revised and scaled back from earlier proposals, which included a large central amphitheatre, an oculus with a view locator and relocated tennis and multi-purpose courts. The overwhelming public outcry was for less construction and fewer bells and whistles, with refurbishments that would make the park more functional while maintaining its formal elegance. The first phase of the project, slated for completion next year, will be confined to the north side of the park, with $3 million of the expected cost already available from various sources. The park’s south side still suffers water issues that need to be resolved, even after a redo of its irrigation system last year. The Friends of Alta Plaza hope to raise money for the rest of the project through grants and fundraising. Rendering of the orchard of apple, pear and fig trees growing at Divisadero and Geary. “LET A thousand flowers blossom,” Chairman Mao supposedly said. Kaiser Permanente has taken a similar approach with the block-long empty lot at Divisadero and Geary it fought — and paid dearly — to clear for a new medical building, now delayed. “We needed a solution that everyone, including the city, was going to be happy with,” says Randy Wittorp, a spokesman for Kaiser. The orchard grew out of a collaboration between Kaiser and Friends of the Urban Forest (FUF), urged on by a community task force. Kaiser bought the property years ago with an eye to future expansion. It reportedly paid more than six figures each to get longtime tenants out of a deteriorating 21-unit pink apartment building and, with a group of local ministers, built 21 replacement apartments across O’Farrell Street. Kaiser decided its new medical building should be in Mission Bay and put off plans to expand at Geary and Divisadero. But what to do with the empty lot? The trees will likely be moved at some point when construction proceeds. Five redwoods were cut in the mini-park at Cottage Row. THERE HAD BEEN TALK for years about cutting down the rapidly growing redwood trees in the park along Cottage Row. Suddenly one day in mid-February the five redwoods were felled, along with a massive eucalyptus tree and other smaller trees. The howls of outrage among many neighbors now seem to be giving way to acceptance. A crew from the city’s Department of Recreation and Parks has removed the trees and the redwood stumps and begun to refurbish the mini-park, which serves as a front yard for the historic Cottage Row homes. New Japanese maple trees — and perhaps cherry trees and magnolias — will be planted in a nod to the heritage of the row before its Japanese-American residents were ousted and interned during World War II. A few redwoods remain on private property. He said the interim plan — what he called “shoestring and duct tape landscaping” — will make the park safer and more usable. “But it isn’t intended to be the end of the conversation — just the beginning,” he said. Cismowski and his crew expect to work in the park every Monday for the next six weeks, completing their limited work by mid-May. They are widening the planters where the redwoods stood, building new steps and adding Japonesque touches. The eucalyptus stump — too big to grind out — will remain. While Cottage Row has lost its redwoods, it has gained its own song — a lyrical melody by singer-songwriter Eve Fleishman, who lives nearby. WORK BEGINS in early March on an ambitious new plan to transform the forlorn public plaza at Fillmore and O’Farrell streets into a dynamic green space that honors the history and culture of the neighborhood. The paved checkerboard with the names of key figures from neighborhood history will remain, but eight squares of bricks will be removed and converted to planted areas with built-in benches. All of the plants will be native to Africa, and African symbols like those on nearby buildings will also be incorporated into the design. References to the earlier history of the area when it was largely a Jewish neighborhood will also be included. “Our plan is to subvert the checkerboard and use the plaza as a way to make sense of a lot of disparate elements that have been added over time,” said Martin. The nonprofit San Francisco Beautiful is coordinating the project with the owners of the property, nearby merchants and city agencies. The public is invited to join a community work day scheduled on Saturday, March 15, which is also when the planting will be done. The plaza is envisioned as the first phase of a larger series of neighborhood improvement projects that will unfold over the next two years. “This is one more bead on the string,” said Kearstin Krehbiel, executive director of San Francisco Beautiful. 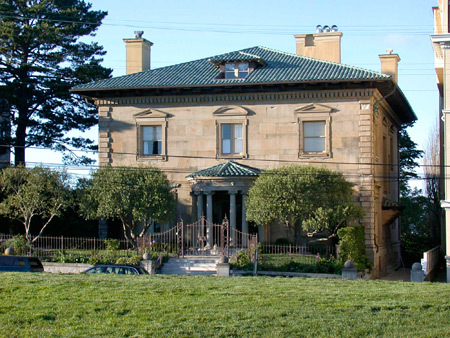 The historic Ellinwood mansion at 2799 Pacific Avenue. 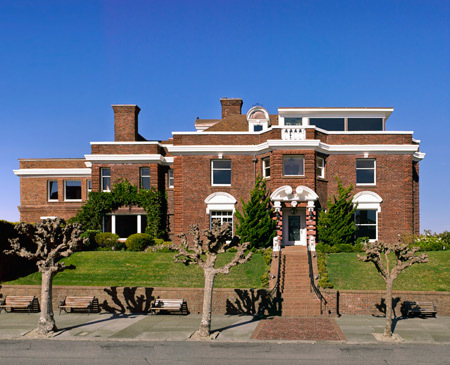 IN THE DEPTHS of the real estate crisis in 2011, the defaulting owners who had spent millions restoring the Ellinwood mansion at 2799 Pacific were removed and the home was put on the market as bank owned. In the same family for more than a century after it was completed in 1894 — and empty for half that time — the house has a rich and colorful history, with a basement billiard room that hosted at least one world championship and a side garden with a tree that was a gift from Queen Victoria, now replaced by a lap pool. The house sold in June of last year for $11.5 million — not much more than the price of the restoration. The new owner — producer-writer-director Chris Columbus (“Mrs. Doubtfire,” “Home Alone,” “The Help” and several Harry Potter films) — is now selling his former home overlooking Alta Plaza Park at 2622 Jackson Street. 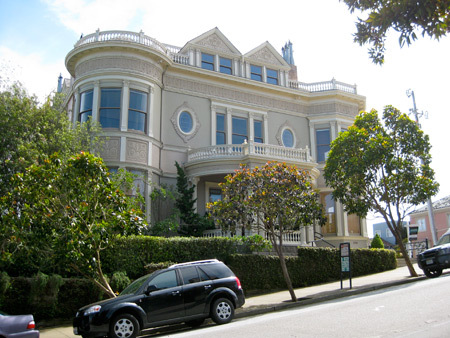 It’s also a neighborhood landmark, designed in 1895 by Willis Polk in the Italian Renaissance style and constructed of sandstone, which is rare in San Francisco. For decades its classical rounded portico welcomed students and guests inside to the Music and Arts Institute. Now it’s a comfortable home with bay views — and a screening room, of course — listed for $13 million. The historic square sandstone house at 2622 Jackson Street. Maria Marchetti is a real estate agent with Sotheby’s International Realty. The dental school’s surface parking lot may become home to 11 townhouses. BY THE TIME it moves downtown next year, the University of the Pacific’s dental school will have made room for a lot of attractive — and expensive — new housing in the neighborhood. Trumark Urban has now bought the dental school’s longtime home at 2155 Webster Street, at the corner of Sacramento, and will convert it into 77 high-end condominium residences averaging 2,000 square feet. Two top-floor 4,000-square-foot penthouses will have views of the Golden Gate Bridge. A COMMUNITY MEETING will be held on Wednesday, July 17, to discuss the plans for the dental school. Trumark is hosting a pre-application meeting required by the city’s Planning Department at 6:30 p.m. in Bart Hall at Congregation Sherith Israel, the synagogue located at 2266 California Street. Already Prado Group has converted the school’s former dormitory building at 2130 Post Street into 71 deluxe rental apartments. Leasing began in early June, and more than half of the apartments have been leased in the first few weeks, said manager Meg Russell. Already 23 apartments are occupied. Of the apartments that remain available, monthly rentals range from $3,195 for a one-bedroom, one-bath unit up to $4,695 for a two-bedroom, two-bath unit. Adaptation of the dental school’s home at Webster and Sacramento will require the developer to build larger units because of the unusually deep floor plan. About 80 percent of the units will be two-bedroom or larger. In addition, Trumark plans to build 11 townhouses on the parking lot behind the building spanning from Sacramento to Clay Street. 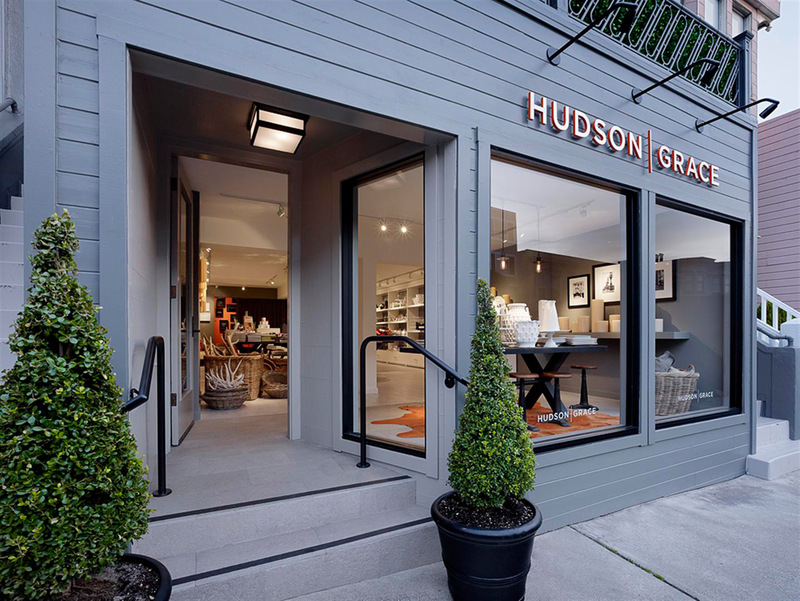 SACRAMENTO STREET’S collection of antique shops, interior designers and home accessory stores got a boost — in offerings and experience — when Hudson Grace opened at 3350 Sacramento a few weeks ago. The new store is the brainchild of Monelle Totah and Gary McNatton, who helped build Williams-Sonoma, Banana Republic, the Gap and Restoration Hardware into international juggernauts. So instead of working on corporate stores around the globe, they decided to focus on just one: their own. And they wanted their “shared dream” to be on Sacramento Street. They named the store after their dogs, Hudson and Grace. Landscaped townhouses might replace the dental school's parking lot. The six-story building at Webster and Sacramento Streets that is home of the dental school of the University of the Pacific — which is scheduled to move downtown next year to Fifth Street — may be converted into condominiums. Trumark Urban, a privately owned development company based in Danville, is exploring the possibility of creating 110 to 130 high-end condos in the existing building. In addition, on the 17,000-square-foot surface parking lot to the west, they would add townhomes and landscaping between Sacramento and Clay Streets. Diamond and Trumark managing director Arden Hearing have been reaching out to neighborhood leaders as part of their due diligence in deciding whether to go through with their tentative agreement to buy the property. 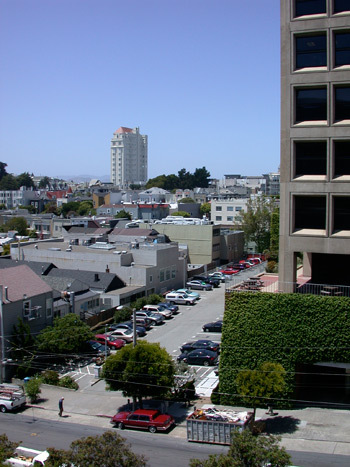 Among others, they consulted with Pacific Heights Residents Association board members Greg Scott and Paul Wermer, who raised the perennial concerns about parking and traffic but responded positively to the idea of creating residences. The building has been widely expected to become another medical building, given its location near the hospital. “This is probably the least impactful use of the property,” said Wermer. Diamond said her company is unlikely to proceed if there is opposition to the project. “We really want the neighborhood’s support,” she said.